Nordic #3: Alteration is the third themed issue of the Nordic Journal of Architecture, edited by Mari Lending, AHO, Oslo and guest edited by Tim Anstey and Catharina Gabrielsson, KTH School of Architecture. The journal collects eight peer-reviewed articles by an international group of scholars that consider the significance of alteration as a key theoretical and methodological term for architectural discourse. These are introduced by an essay by Anstey and Gabrielsson which frames the significance of alteration as a term for architecture, and supported by six studies of alteration projects in practice. By taking up the theme of “Alteration” this publication aims to pose serious questions the architecture profession. Today in post-industrial societies clusters of problems revolve around the reuse of existing structures, assemblies, and environments, rather than the construction of new ones: architects’ core activities are increasingly concerned with adjusting what is already there. In stark contrast, however, educational, practice, and procurement structures in architecture and the building industry are still tied to the logic of new construction. We need, then, to start to theorize this condition where alteration forms a central part of architectural practice. To understand what is at stake for architecture when it takes alteration into its discourse? The journal anthology derives from an international conference entitled Alteration held at Moderna Museet, Stockholm in September 2011, and includes contributions from key international actors in a range of fields including architecture, heritage and preservation, architectural history and theory, critical studies, and curatorial practice. Tim Anstey is Senior Lecturer in Architectural Technology and Director of Research at the KTH School of Architecture, Stockholm. He is co-director of the Strong Research Environment "Architecture in the Making" funded by the Swedish Research Council Formas 2011-2015. What we talk about when we talk about alteration. Gabrielsson, C.; and Anstey, T. In Nordic - Journal of Architecture, volume 2:3, s. 8-9. 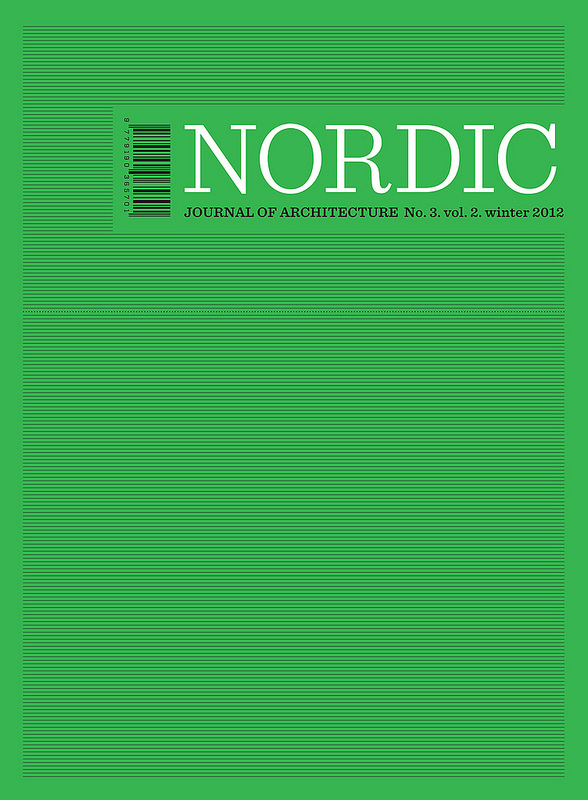 Nordic - Journal of Architecture Copenhagen : Arkitektens forlag, 2013. The art of organizing attention. Anstey, T.; Arrhenius, T.; and Otero-Pailos, J. Nordic Journal of Architecture, 3(2). 2012. Housework. Gabrielsson, C. In Nordic Journal of Architecture, volume 2:3, s. 78-81. Nordic Journal of Architecture Copenhagen : Arkitektens forlag, 2012. Nordic Journal of Architecture : Alteration. Gabrielsson, C.; and Anstey, T. Arkitektens forlag, Copenhagen, 2012.